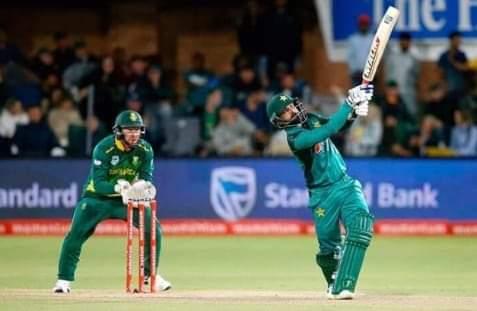 Karachi: Imam-ul-Haq and Mohammad Hafeez hit half-centuries as Pakistan cruised to a five-wicket win over Soutpouth Africa in the first of five matches against Pakistan atTeeorge’s Park on Saturday. Opener Imam hit 86 while Hafeez finished on an unbeaten 71 as Pakistan chased down their 267-run target with five balls to spare. Earlier, Hashim Amla hit his 27th one-day international century as South Africa made 266 for the loss of two wickets. Amla (108 not out) shared a second-wicket partnership of 155 with debutant Rassie van der Dussen (93) but the pair were unable to dominate against steady bowling on a slow pitch. “It was a tough wicket,” Amla told SuperSport television as he left the field at the end of the innings. “You have to bide your time. I think it’s a good total.” Although Pakistan were only able to claim two wickets, they bowled well on a windy day, with captain Sarfraz Ahmed juggling his bowlers in short spells. Scoring was slow during the middle overs with seamer Hasan Ali and leg-spinner Shadab Khan bowling particularly well. They took one for 42 and one for 41 respectively in their ten overs. But the scoring rate picked up and Van der Dussen hit six fours and three sixes in a 101-ball innings. Amla made his runs off 120 balls with seven fours and a six. South Africa won the toss and decided to bat in the first one-day international against Pakistan on Saturday. The pitch at St George’s Park looked good for batting, while a strong wind seemed likely to pose a challenge to bowlers and fielders. “It looks [like] a good wicket and there may be a bit more spin in the second innings,” said South African captain Faf du Plessis. South Africa fielded two new caps in batsman Rassie van der Dussen and fast bowler Duanne Olivier, who was man of the series in a recent Test series between the two countries. “We are used to playing in wind because we have played in Wellington (New Zealand),” said Pakistan captain Sarfraz Ahmed. Ahmed said he was determined to make a good start to the series on a ground where Pakistan are unbeaten in three previous matches against South Africa, with two wins and a no-result. Pakistan: Sarfraz Ahmed (captain, wkt), Fakhar Zaman, Imamul Haq, Babar Azam, Mohammad Hafeez, Shoaib Malik, Shadab Khan, Imad Wasim, Faheem Ashraf, Hasan Ali, Usman Shinwari.